The first UOTeachOUT event in 2010 brought togehter a small group of pre-service teachers, current teachers, administrators, faculty, and community members who wanted to work together to address issues of homophobia, transphobia, sexism, and gender inequality in schooling. This small group discussed the challenges of speaking up in school settings to support gender identity and sexual orientation minority youth and families. In addition the group discussed the challenges of being visible as an advocate for these youth. Tina and Julie provided these teachers with “safe zone” posters and store bought rainbow lanyards to use in classrooms. There was a deeply positive response to this effort to break silence and be seen. There was also an unintended consequence. Community members who took part in that first TeachOUT began to report back to Tina and Julie that they were have all kinds of new conversations and connections with people as a result of wearing a rainbow lanyard for their school I.D. These advocates were learning, practicing, and advocating like never before because they could suddenly be seen differently in the school setting. 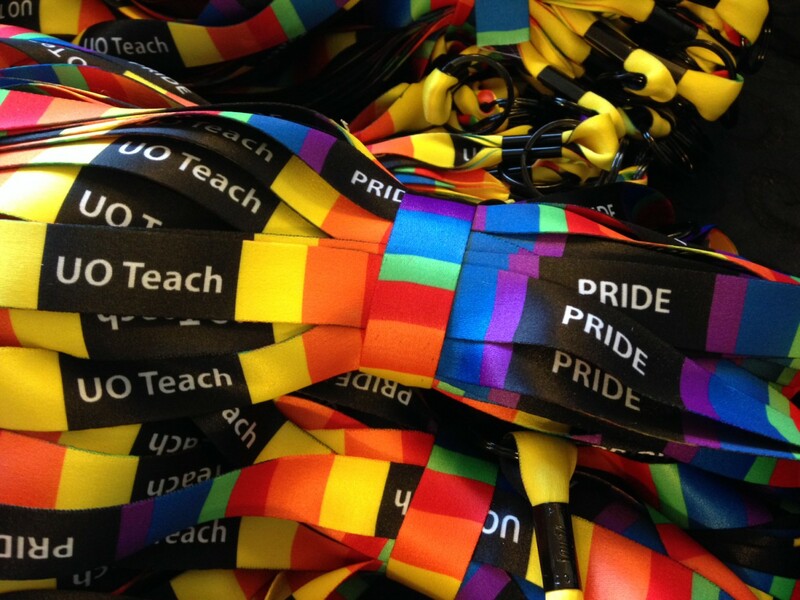 A decision was made to order pre-printed UOTeach rainbow lanyards for the 2011 UOTeachOUT. That was the beginning. Since that time hundreds and hundreds of UOTeach / PRIDE rainbow lanyards have been distributed across seven school districts. Each lanyard is accompanied by a training and a wish that the silence will be broken and the space will be made more welcome. In time we will begin to share stories here that have been gifted to us by teachers who have marked themselves as advocates for diverse youth.